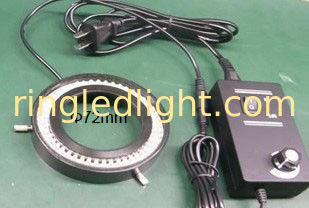 3, the other requires a large diameter lens auxiliary lighting equipment and so on. 1, high brightness, long life, soft natural lighting without flash, energy saving, easy installation. 2, the brightness can be adjusted, is stereo microscope, bonding microscopes, stereo microscopes and other optical instruments with the ideal source. 4, uniform illumination: 144LED light beads 360 ° uniform illumination on the object being observed, no ghost produced, high definition.